Don’t worry about doing the measurements to the exact millimeter. Just get them as close as you can without stressing over it. Sometimes you may need to trim some of the keys so that when you press them they don’t run into another one, but they should work after a little bit of tweaking. Step 2. 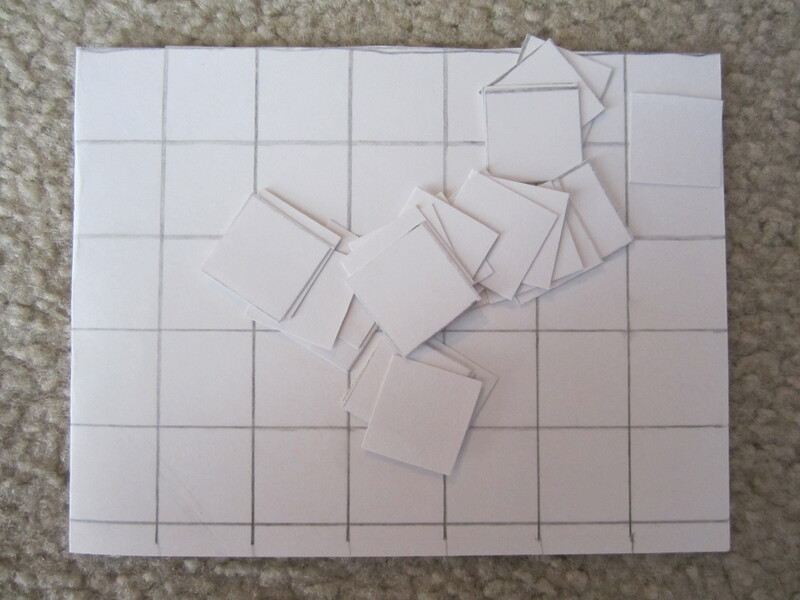 Fold the piece of regular paper in half. Step 3. Leaving an inch gap or so, tape it over the piece of cardboard. Step 4. 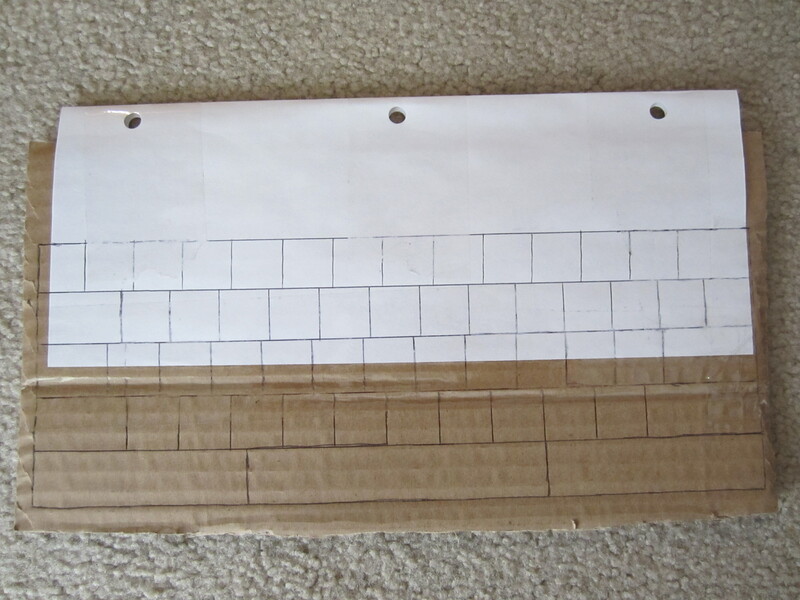 Punch three holes into the paper (spaced to match with your binder). Step 4.5 Scroll to the bottom of this post to find all of the measurements for the keys, key springs and the keyboard. Step 5. 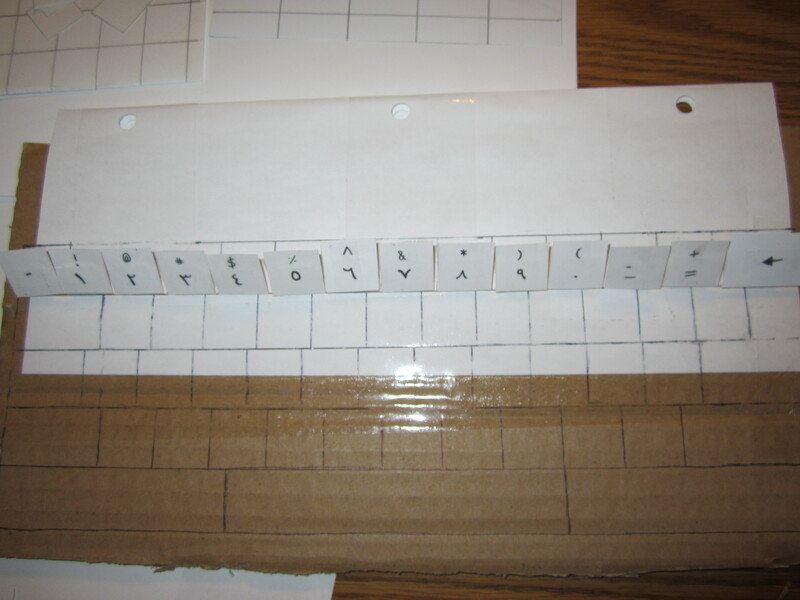 Using the ruler and the pencil/pen, measure out the space for the entire keyboard and fill in each row. Step 6. 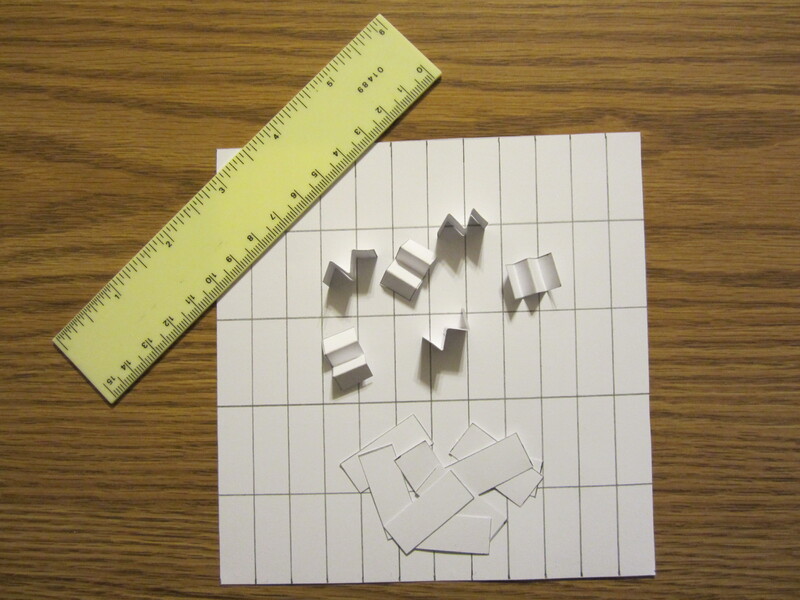 Using your ruler and the pen/pencil, measure out the keys onto a piece of card stock paper. Step 7. 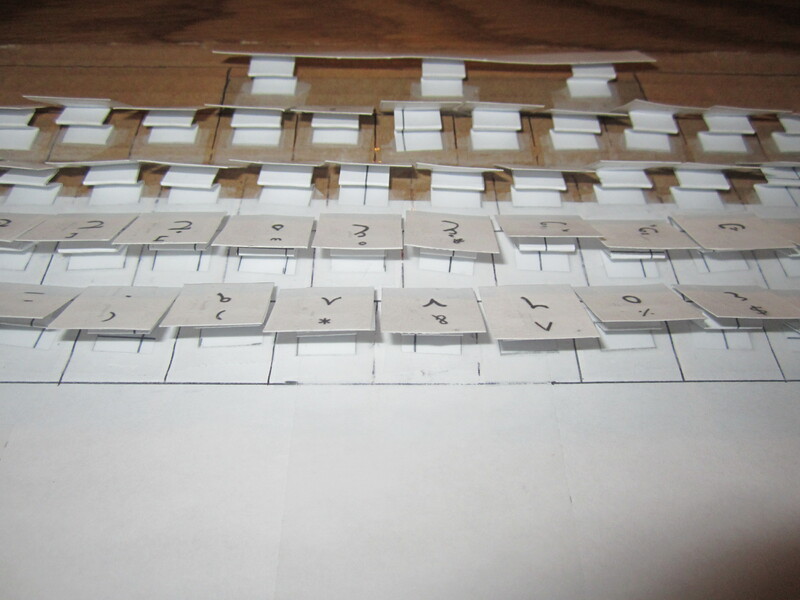 Using the ruler and the pen/pencil, measure out the key springs onto a second piece of card stock paper. Step 8. Cut out the keys and the key springs with the scissors. Step 9. Fold each key spring. Step 10. Open your computer and make a list of every English key. Then, change the language input to your second language and match them to the English keys. Step 11. Make sure that you got every single letter — UPPER CASE *and* lower case. On some keyboards, take Russian for example, most of the regular alphabet keys will remain the same in the upper and lower case setting. 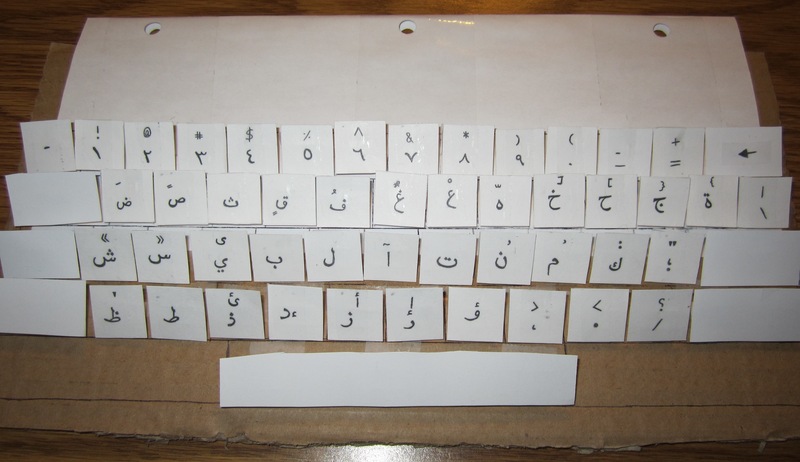 In others, Arabic for example, multiple keys change their letter when you use the ‘shift’ key. So make sure you get all of the keys with and without the shift key. The only keys you should *NOT* get are: tab, shift, caps lock, control, command, alt, option, delete, and enter (and the up, down, left, and right keys if you have them). These keys have no letters attached to them in any language (at least, none that I’ve tried so far, and I have tried: English, German, Russian, Maltese, Spanish, Arabic, Czech, Greek, Thai, Karen, Ukrainian, and Chinese). Step 11.5 Find some good audio stories or some favorite songs to turn on while you do steps 12-14. Step 12. Starting with the upper left corner key, pick up one of the squares you cut out and write the English keystroke on one side. Flip it over and carefully write the matching letter in your second language. Tape a small piece of scotch clear tape over the top of the letter so that it won’t smudge or get damaged when touched repeatedly. Step 13. Tape one end of the key spring onto the back of the key, using the clear scotch tape, and then tape (clear scotch tape) the spring onto the keyboard on the marked out space for that specific key. Step 14. Repeat step 12 and 13, trimming keys as needed (with the scissors) when they overlap slightly, until you have placed every single key on the board. Step 15. Find a large book (dictionaries do well, *especially* a dictionary in the language the keyboard is in) and carefully set it on top of the keyboard, making sure all of the keys are bent the correct way. Step 16. Leave the book on the keyboard for a couple of days and then put the book back on the shelf and place the keyboard inside your binder. Step 17. Use the keyboard whenever possible with all of the words you’ve memorized in the new language. Keep a spelling/vocabulary list with the keyboard to help you out at first. Step 18. Practice, practice, practice!! The more you practice using your keyboard, the quicker you will become, and the better your brain will remember where each of the new letters are placed. I used to take my Russian keyboard with me on long car trips (and even short ones!) and practice the handful of phrases I knew over and over again. 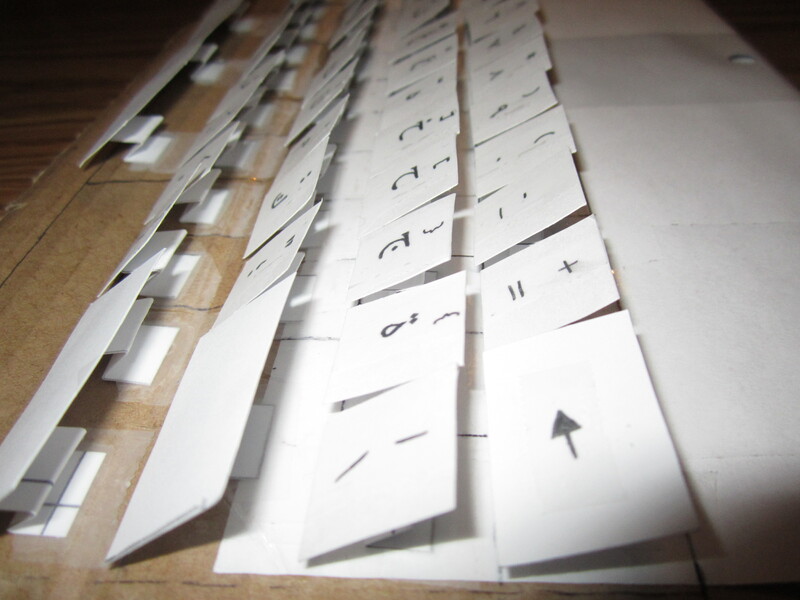 I was agonizingly slow at first, but after a bit of practice my fingers gradually learned where each new key was placed. Practice keyboards can also be used at doctors offices while you wait in the office, or anywhere else where you have a couple of spare minutes. Eventually you will find yourself mixing up your new language with your old one, at least, if you pick Russian. It can be challenging with some languages (Russian) because so many of the letters look similar to ours (English). I am unable to type any English words in Russian (transliteration) or vice versa (Russian words in English letters (transliteration)). I can translate, and type English in English, or Russian in Russian. But I cannot cross over or my brain becomes very, very confused. Although I have not yet memorized my Arabic keyboard, I’m hoping it will not confuse my brain as much as the Russian one did. After all, none of the letters look anything like ours. Remember that the whole point of making this keyboard is to help you memorize the keys. Once you’ve done that, you will no longer need the keyboard. I’d suggest you then pass it on to someone who will use it and learn from it. I can now type around 50 to 60 wpm (words per minute) in Russian. Speaking of which… I should find someone to give my Russian keyboard to. Пока!